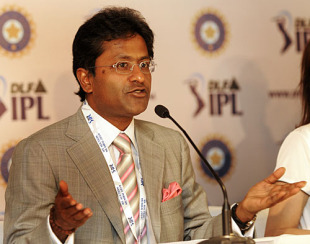 Lalit Modi, in his reply to the second show-cause notice served on him by the BCCI - which was prompted by a letter from Giles Clarke, the ECB president - has said Clarke's allegations were "motivated", given their "history of run-ins", and "not worthy of credence". His reply - a copy of which is with Cricinfo - also said that the board, knowing this background, should have backed him and sought his comment before issuing the notice. The notice was issued to Modi on May 6, ten days after he was suspended from his position as IPL chairman. It followed an email sent by Clarke to BCCI president Shashank Manohar alleging activities by Modi that were "detrimental to Indian cricket, English cricket and world cricket at large." Both communications referred to a meeting Modi held on March 31 in Delhi with representatives of three English counties in which he is alleged to have discussed a parallel IPL in England and Wales. In his reply, which runs to 24 pages and has five supporting documents, Modi has cited specific examples of his differences with Clarke which, he claims, began during the inaugural season of the IPL. "It is well known in informed cricketing circles that Mr. Clarke holds a personal grudge against me. This started as far back as 2008. Mr. Clarke came to India at the time of the IPL Season 1 and noticed that the IPL was a resounding success." He has mentioned the ECB's brief relationship under Clarke with Allen Stanford, the Texan billionaire, which ended in early 2009 when the latter was charged with fraud. The contrast between that scenario and the IPL, which was "going from strength to strength", is offered as a reason for the animus. Other examples cited include the ECB's decision to not accept the stakeholding offered to it for the Champions League; the IPL's decision to stage the second season in South Africa instead of England; the general scheduling of the IPL, whose later games clashed with the English domestic season and the scheduling of the 2010 Champions League; the IPL's insistence that its franchises be given the preference by players taking part in the Champions League; and the status of English players with the unofficial ICL. Part of his reply dealt with the way the issue has been handled by the BCCI and he has some strong words for N Srinivasan, the board secretary, who sent him the notice. "The manner in which, on completely flimsy and frivolous grounds, a Show Cause Notice has been issued shows the prejudged, premeditated and biased mind set with which the Hon Secretary is working. The fact that Hon. Secretary had chosen to act on the basis of an email which was merely a perception of the sender with no confirmation or acknowledgement at any stage by me itself shows that the 2nd Show Cause Notice has been issued on flimsy and/or non-existent grounds." He also repeated his request to Manohar and Srinivasan for them to step down from the probe against him and instead appoint an independent panel to adjudicate the matter.